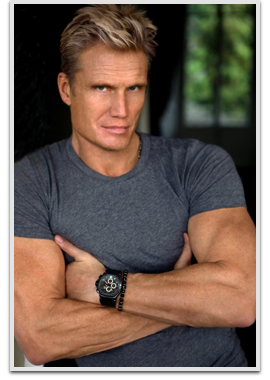 Dolph Lundgren is a Swedish actor, director, and martial artist. Lundgren’s breakthrough came when he starred in Rocky IV in 1985 as the imposing Russian boxer Ivan Drago. Since then, he has starred in more than 40 movies, almost all of them in the action genre. He portrayed He-Man in the 1987 fantasy/science fiction film Masters of the Universe, and Frank Castle in the 1989 film The Punisher. In the early 1990s, he also appeared in films such Dark Angel (1990); Showdown in Little Tokyo (1991), alongside Brandon Lee; Universal Soldier (1992) opposite Jean-Claude Van Damme; Joshua Tree (1993), opposite Kristian Alfonso and George Segal; Johnny Mnemonic (1995), opposite Keanu Reeves; and Blackjack (1998), directed by John Woo. In 2004, Lundgren directed his first picture, The Defender, and subsequently helmed The Mechanik (2005), Missionary Man (2007), Command Performance (2009), and Icarus (2010), in which he also starred. After a long spell performing in direct-to-video films since 1995, 2010 marked his return to theaters with The Expendables, an on-screen reunion with Stallone, alongside an all-action star cast which included, among others, Jason Statham, Jet Li, Stone Cold Steve Austin, and Mickey Rourke. He reprised his role as Gunner Jensen in The Expendables 2 in 2012 and the upcoming The Expendables 3 in 2014.